We currently live in a 600 square foot apartment. Despite this rather severe space limitation, I’ve managed to store quite a bit of food in our home. This is a huge advantage, as having adequate space for food storage allows you to save money by buying in bulk and taking advantage of sales. I also find that having a lot of food on hand just makes life easier because I don’t have to restock my supplies often and mostly only shop for produce from week to week. 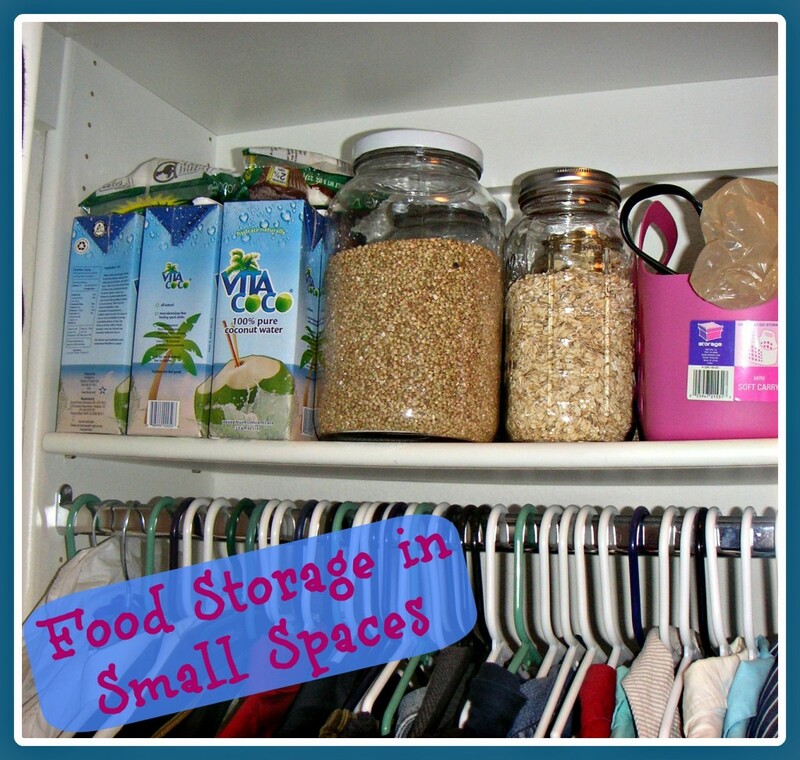 Although there’s no getting around the fact that food storage is easier when you have a lot of space, large scale food storage can still be done in small dwellings. Here are five strategies that have worked for me. If you’re worried that you may forget about all of the unusual places you’ve stored your food, consider keeping a list of locations and items so you don’t lose track of things. Google documents is a great option for a list that’s nearly impossible to misplace. If you still need more storage space after combing through your home’s available options, consider purchasing more shelving units. This can be particularly helpful if you need more space in a particularly prized area, such as your kitchen. To compensate for the fact that my kitchen is lacking in counter space, I’ve purchased two bookcases that reside in my dining room. 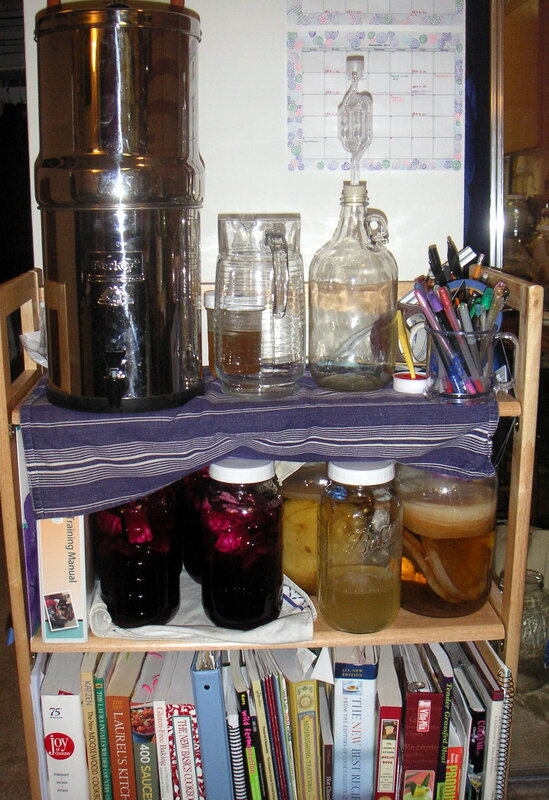 They hold my various ferments, my Berkey water filter, unrefrigerated produce and my cookbooks, all things that are highly advantageous to store near the kitchen, rather than somewhere else in my apartment. I bought fairly nice wooden shelves because I wanted them to complement the dining room, but any sort of shelving unit would probably work. If you’ve recently switched to following GAPS and/or eating traditional foods, there’s a good chance that you have a few foods in your pantry that you’re not currently eating. Go through your pantry and pull out any foods that you know you don’t want to eat anymore, such as foods with hydrogenated oils or MSG. Get rid of these foods, either by giving them to friends, Freecycling them, or simply throwing them in the trash if that is your only option. I have a hard time getting rid of food that I’ve paid for, even if I think I won’t ever eat it again, but I try to keep in mind that I’m far better off having the space than the food. You may also have some items that you’re not eating temporarily but may return to in the future. Try to relocate these items to less prized storage areas to free up space for the things that you’re eating now. For instance, I have quite a few grains and beans that I bought before we started GAPS. 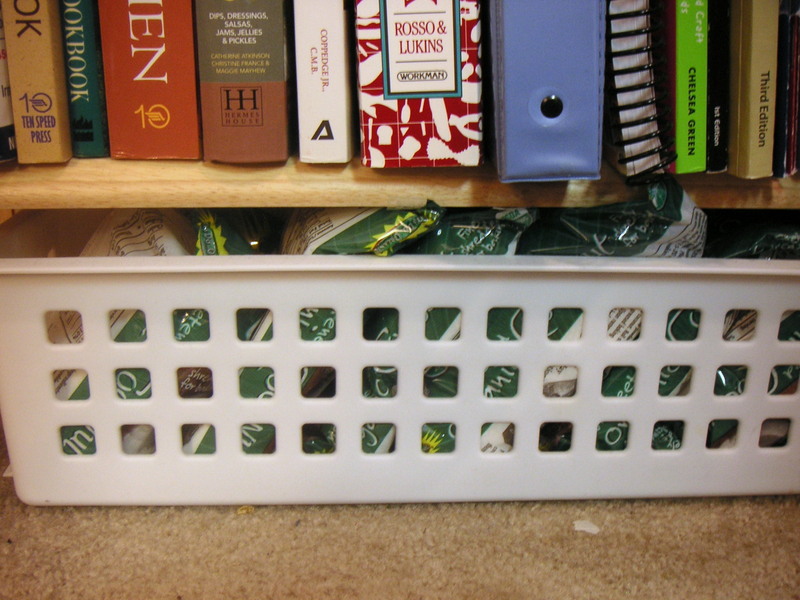 I recently moved most of them from my pantry to a nearly inaccessible spot in our coat closet. They’re very difficult to get to, but that doesn’t matter since I don’t need them right now. That move freed up a lot of prime real estate in my pantry, giving me more space for foods that I use daily and want to be able to conveniently access. Just like cutting your budget in other areas allows you to expand your food budget, getting rid of non-food items can free up more spaces to store your food. I’m not very good at getting rid of things but I’m always glad when donating a few items allows me to free up some extra space in my closet. One sure-fire way to store more food is to make some of that food smaller. 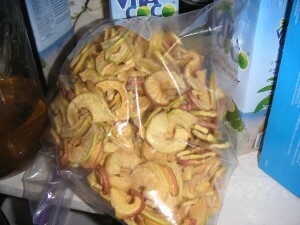 Dehydrating food makes it take up a LOT less space. Not all foods can be dehydrated, of course, but dehydrating foods before storing them in your pantry can make large-scale food storage much more realistic. I haven’t done a ton of dehydrating yet, but I was amazed at how little space my zucchini and apples occupied after they’d been dried. I have this dehydrator, which I am very happy with. What are your strategies for storing food in your home? Wow, these are great ideas! We keep a lot of our extra food storage in the master closet. I can't imagine having that many clothes anyway! 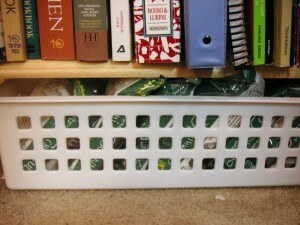 I've also seen people keep long-term food storage behind couches and under beds. Thanks for sharing, Dianna! I know what you mean about the master closet--we have our clothes in there, but I also keep a lot of miscellaneous stuff that doesn't fit anywhere else! Great post! 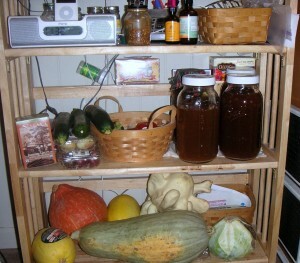 I added a link to it in my tips for a tiny kitchen where I explain some of the ways we've found space for food storage. In this house, we have a full basement, so most of the food is down there. When I lived in a dorm, I had some of my food on the shelf above my clothes, just like in your first picture! Thanks for sharing my post, 'Becca! I use the built in robe in the spare room as an overflow pantry as my one in the kitchen is only a single door with shelves. If you are short of space, try building shelves that go right up to the roof and store lighter things (dehydrated items) up there. I keep a book with what I have in the freezer, so I know what is in there, when it was put in and where it is in the freezer to save on rumaging. My son built me a cupboard to store my clip lock containers of nuts, beans etc for his Year 12 major project. It's great. It has 12 small pidgeon holes that I can slide the large containers (hold 5kgs beans) into. I am going to put a label holder on the outside with what is in there and the expiry date, to save opening to see what I put in there. The bottom of the cupboard holds 3 x 20 litre containers of tahini and honey, plus smaller jars of olives, pickles etc. It's made out of recycled, solid hardwood, so will hold the weight!